Winters are coming, and most people love this season and welcome it wholeheartedly. It gives us a pleasant change in everything; be it the cold chilling weather, clothing, food or getting cozy in blankets. But we can’t deny the truth that winter can also damage your skin to the core. The cold, breezy air can make your skin dry, red, itchy and ruptured. 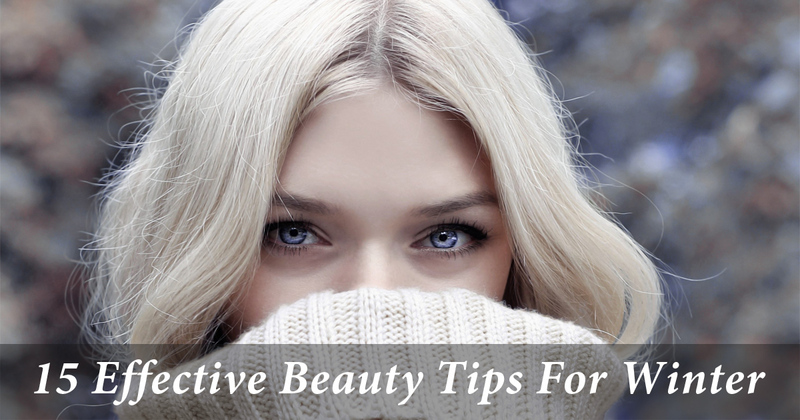 However, it is not a big problem, by putting some extra effort into our skin care; we can stand out beautiful and confident in winters too with healthy and happy glowing skin. 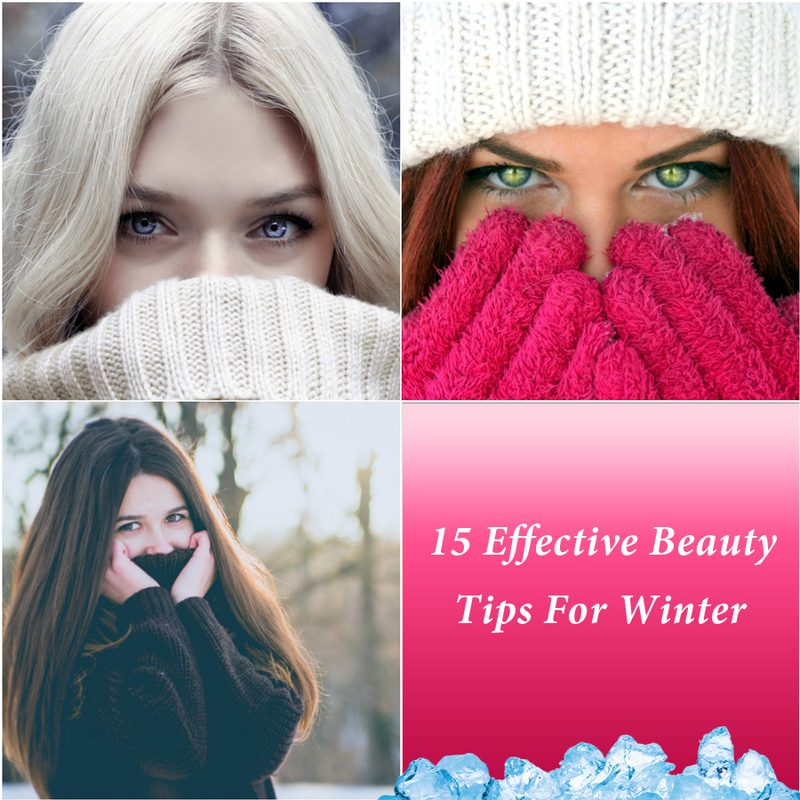 I have come up with 15 beauty tips for winters that will help you to get rid of dry and damaged skin making your skin look flawless, nourished & beautiful. These are amazing beauty tips for dry skin too. Drink a lot of water, it will help you fight with the dryness that comes with the cold air. If you stay hydrated all the time, it will make your body and skin stay moisturized and refresh. However, Drinking water is recommended throughout the year by the professionals to have healthy skin and to look young for longer and it’s the most effective winter skin care tip for you. Everyone loves to eat hot and tempting food during winter weather. This weather can make you intake more calories. Avoid indulging in eating a lot rather choose healthy options like soups, green tea, green leafy vegetables, avocados etc. that not only protects tissues and boosts immunity but also keeps your body hydrated and skin moisturized. Moisturizing your skin is very essential during winters specially after washing any body part because after washing, the skin becomes dry and if you don’t moisturize it immediately, it can cause redness, winter eczema, cracks and itching in your skin. Moisturizing keeps your skin cells hydrated and protect it from damages and cracks. Choose your moisturizer wisely, as per your skin type and skin requirement. It is one of the most crucial winter skin care. You can also use home-made moisturizer that suits your skin. Mix one-fourth portion of glycerin with three-fourth portion of lemon juice, mix it well and keep it in a bottle. Use it twice daily. It is a natural moisturizer that not only moisturizes your skin but also prevents it from cracks, redness, itching or any skin problem. You can use it on all over your body and even on cracked lips. While going out in a chilling winter morning it is only your face that cannot be covered properly and can result in red and cracked cheeks. Apply glycerin and lemon mixture generously on your face as this homemade beauty tip for winter proves to be one of the best winter care for face. In winters, after taking bath and before wiping off your body, take small amount of coconut oil on your palms and apply it on your body parts. It will keep your skin moisturized, nourished and soft throughout winters. In winters, the cold air steals the natural oil from your skin and leaves it dry and cracked. It can cause severe havoc to your lips as well. Lip care in winter is also very important. Apply ghee or petroleum jelly on your lips in day time, it will help you soften and moisturize your lips. At the time of sleeping during night, pour few drops of mustard oil in your navel and see magical result in the morning. This tip is very effective if you have cracked lips in winters. It is important to wash or rub your body parts with a granular substance or scrub to remove dead skin cells. Without exfoliating the body parts, it becomes hard for the moisturizer to get absorbed into the skin to soften and humidify for longer. Choose an exfoliating mask for your skin and use it on the affected and exposed body parts. After the exfoliating mask, immediately apply moisturizer to let it get in deep into the skin and feel the healthy and well moisturized skin. You can also make homemade exfoliating mask or scrub according to your skin requirement. Eat enough citrus fruits like sweet limes, lemons, apples, oranges, and vegetables like spinach, tomatoes, cucumbers, beans and carrots. All these fruits and vegetables contain lots of vitamin C and zinc that is essential to maintain the healthy production of collagen and elastin. Flaxseed is also recommended to ingest for a healthy as it contain omega-3 that makes your skin look smooth and nurtured. Yes, you read it right. In winters, the cold air pulls the natural oils from our skin and makes the skin dry, dull, cracked and dehydrated. Oils are considered good moisturizer in winters that stay for longer and help in rejuvenating the dull and dry skin. Consumption of almond oil, olive oil, coconut oil, avocado oil and mustard oil in winters provides your body and skin ample amount of moisture and oil that harbor your skin and makes it smooth, soft and hydrated. In the cold weather, it is very alluring to have hot showers. It gives immense comfort to get the warmth of hot shower in a low temperature. But it is also true that hot water separates the oil and moisture of skin quickly and makes the skin dry, and if not get moisturized immediately it can cause winter eczema. So if you love your skin, instead of hot water, choose lukewarm water to shower, wash your face and hair. After a warm shower, apply a moisturizer as soon as possible to prevent dryness and cracks in your skin. Cover your body as much as possible while going out in cold wind of winters. Wear cap, socks, hand gloves and scarf if you are going out as the cold air vanish the natural oils in your skin and make it dry. Also, apply sunscreen lotion all over the body parts that are left exposed to sun. The warmth of sun rays might feel pleasant during winters but the ultra violet rays can harm your skin a lot. Protect your Feet and heels. Apply heavy moisturizer, petroleum jelly or glycerin based creams on your feet and heels. If you have cracked heels, then, during night cleanse your feet with light soap and scrubber; apply suitable thick cream and wear socks. If you don’t like to wear socks, then just lie-down on your bed and let your feet still and untouched the whole night. It will show desirable results. Exfoliate your feet once or twice a week to remove dead skin to let the moisturizer get absorbed into the skin easily. Daily skin care routine is a must to do during the winter season and it is actually easy to follow. It just takes simple steps to do twice daily, preferably in the morning after bath and at night before going to bed. First of all, cleanse your face and other body parts that are exposed to cold air. After cleansing, apply a daily light moisturizer to get into the skin. And during the night, cleanse your skin and apply a suitable night cream or use a heavy moisturizer. Apply the moisturizer on wet skin as it helps to take in moisture better. These are the few dry skin care tips that can give you tremendous result in your skin and let you flaunt your healthy, happy and attractive skin in the winters too.